The size, shape, location, and existing features of childcare center outdoor spaces vary greatly. Some may exhibit unique elements such as play equipment and mature trees. Most require additional activity settings to increase play and learning opportunities. Activity settings add value by being designed to support specific play and learning activities; for example, water play, one of the “top ten.” The addition of trees, shrubs, flowers, and grasses further increases play and learning value by connecting children with nature—which in turn supports healthy child development. Including vegetables, fruits, and nuts adds even more value by helping children understand the connection between healthy eating and the Earth as our source of food. 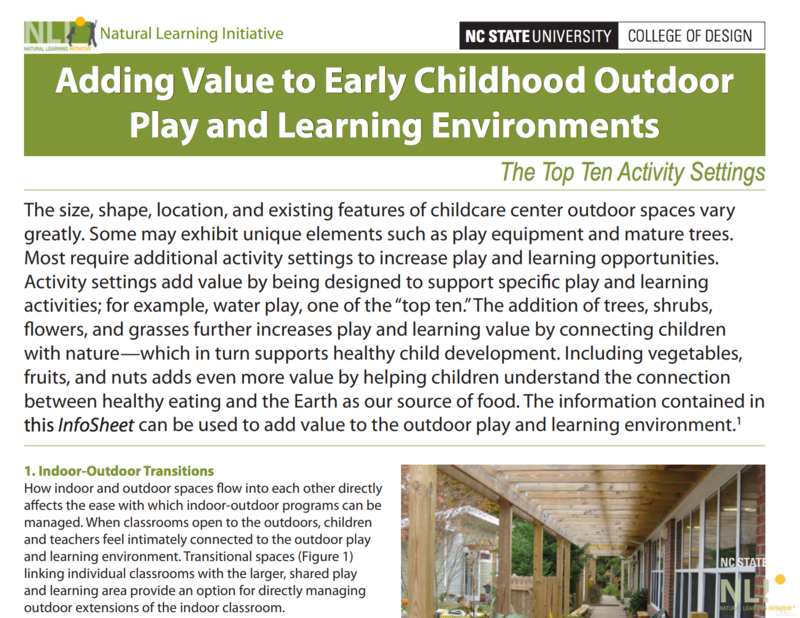 The information contained in this InfoSheet can be used to add value to the outdoor play and learning environment.